If you’ve mistakenly shrunk a garment made from merino wool in the dryer, it may be possible to restore it to its original size. By using a process similar to one that the professionals use – called knit blocking -- it is possible to "unshrink" wool sweaters at home. You can expect to increase your sweater by as much as a size and a half using this process, and it will work on a variety of knit fibers. 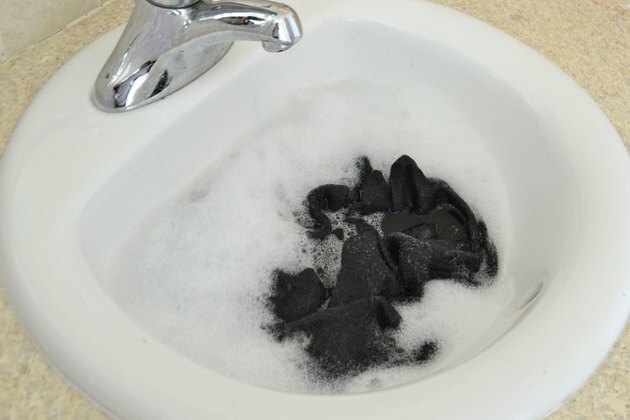 Fill a sink with enough lukewarm water to cover the sweater you wish to return to its original size. Add a generous amount of hair conditioner to the water, and some mild detergent to freshen the sweater, if desired. The hair conditioner will loosen and relax the yarns, which will allow you to re-size the sweater without stretching it out of shape. 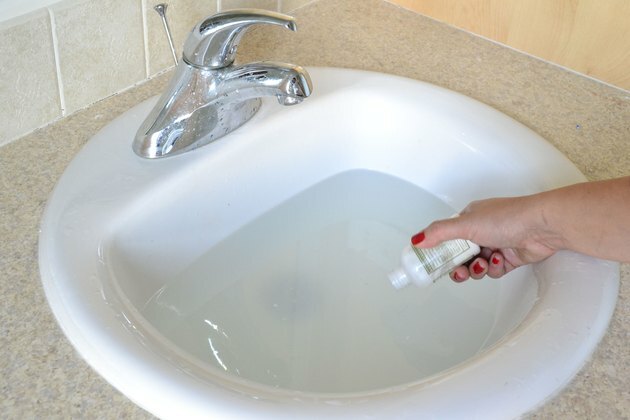 Mix the water with your hands to dissolve the detergent and conditioner. Submerge the sweater and gently knead it. 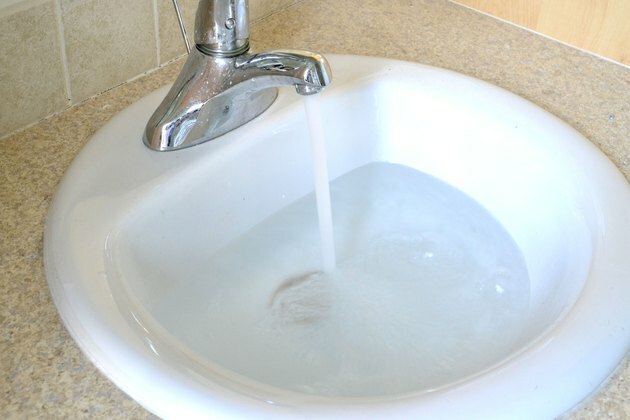 Once you've worked the conditioner into the fibers, drain the water from the sink. 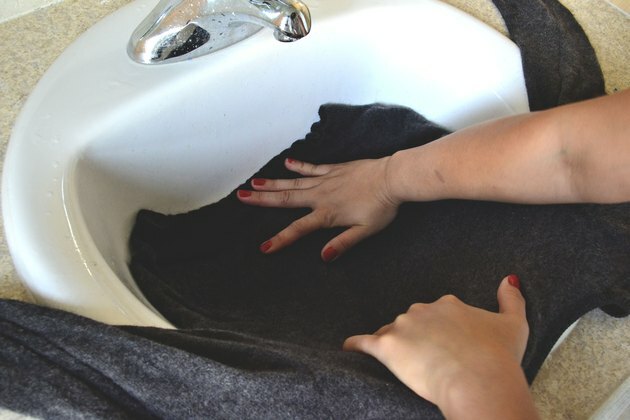 Gently press the sweater against the bottom and sides of the sink or tub to squeeze out the majority of the excess water and remove the sweater from the tub. Lay the sweater flat on a bath towel and place another towel on top of the sweater. Press down on the top towel and continue to squeeze water out of the sweater until the towels have absorbed most of it. If necessary, repeat this procedure with dry towels. Lay the sweater on a flat surface and gently pull it back into the desired shape and size. Stretch it in all directions, and concentrate your efforts on the armholes, sleeves and neckline – any areas you feel have shrunk the most. Allow the sweater to lay flat, and gently stretch the desired areas one or two more times before it dries completely. Wash the sweater in cold water by hand or using a gentle machine cycle to remove the hair conditioner. Reshape it and allow it to dry flat before wearing. If your sweater is large, or you prefer more space to work, use the bathtub instead of the sink. This entire process may be repeated as needed. You will have better results if you "unshrink" a sweater gradually. Allow your sweater to dry in a cool area to avoid any further shrinkage. Do not wring excess water out of the sweater -- you may end up with a garment that is larger than before, but it will also be stretched out of shape. 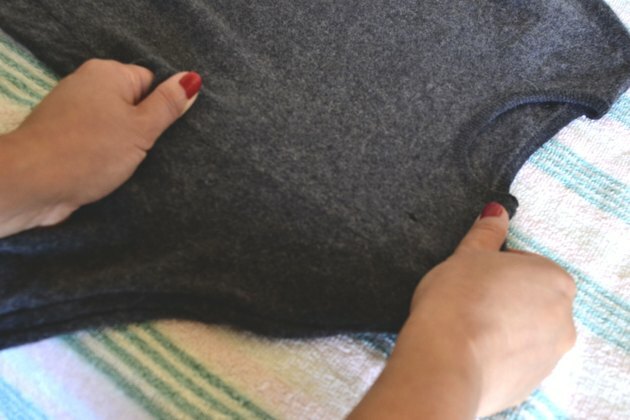 If you are concerned that attempting this process at home may result in further damage to your garment, contact a reputable dry-cleaner who provides knit-blocking services. Margaret&#8217;s Cleaners: What Is Knit Blocking?